Bambiraptor. Photo © Rob Gay. We all know now that birds are dinosaurs, right? The clade Maniraptora (which is defined as containing all dinosaurs closer to birds than to ornithomimids ) is the group of theropod dinosaurs that many paleontologists believe birds were derived from some 150 or so million years ago, in the Jurassic period. Hence, according to phylogenetic taxonomy, birds are by definition maniraptorans, and the other maniraptorans are their closest relatives. Velociraptor skull. Photo © Rob Gay. dissimilar, but have enough structures in common (synapomorphies) to unite them as a group. Maniraptorans are united by the possession of modified elements in the wrist; the semilunate carpal is a bone unique to this group  along with other modifications of the forelimb, it makes the flight stroke in birds possible, and was probably co-opted by birds for flight from a grasping function. Other characteristics present in typical maniraptorans include a fused clavicle (furcula, or "collar bone") and sternum ("breast bone"), a pubis (part of the pelvis) that points downwards rather than forwards as in typical saurischians, a shortened and distally stiffened tail, long arms, and a manus (hand) which is larger than the pes (foot). We'll present some of the most accepted members of the clade Maniraptora; their position may very well change with future studies. 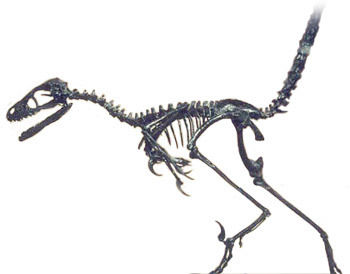 Troodontids: The smartest non-avian dinosaurs? Oviraptors: Strange maniraptorans with evidence of devoted parental care.